Printing error means 7,000 letters begin "Dear John Doe"
WASHINGTON (CNN) -- The U.S. Army is apologizing to thousands of Army families who received letters beginning "Dear John Doe" after losing a loved one in Iraq or Afghanistan. Army Chief of Staff Gen. George W. Casey Jr. is sending a personal letter to the families who received the letter. Some 7,000 letters were sent in late December to notify families of services or gifts surviving family members can receive from nonprofit organizations that help families of fallen soldiers, according to an Army statement Wednesday. The letters also had improper address information at the top of the correspondence. Instead of the receiving family's name and home address, the letters said "Army Long Term Case Management." The letters were printed by a contracting company and sent by the U.S. Army Human Resources Command's Casualty and Mortuary Affairs Center in Alexandria, Virginia. The center issued a formal apology Wednesday, according to the statement. 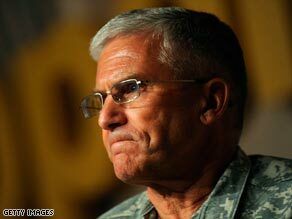 "There are no words to adequately apologize for this mistake or for the hurt it may have caused," Brig. Gen. Reuben D. Jones, Army adjutant general, said in the statement. "It is important the original intent of the letter is not lost. The organizations mentioned are dedicated to honoring loved ones and recognizing their sacrifice and commitment," the apology continued. Army Chief of Staff Gen. George W. Casey Jr. is sending a personal letter to the thousands of families who received the improperly addressed letter, according to Paul Boyce, an Army spokesman. Merrilee Carlson, president of the veterans and family support group Families United, was told by the Army that families would be receiving one of these improperly addressed letters within the next few days. "We want to let people know these letters are coming so they are not surprised when they open them," she said. Carlson is the mother of Sgt. Michael Carlson, who was killed in Iraq in 2005. She said the Army told her she was among those who would receive a letter on Wednesday. "This was a tragic mistake, but I believe it was not done maliciously," she said. "The Army would not do this intentionally to people." While there have not been 7,000 soldiers killed in Iraq and Afghanistan, the Army often sends letters to primary and secondary family members.